Inspired by nature and crafted by hand in a little factory in the Swedish woods, this two piece set of Strawberry Thief Coasters is the result of a passion for natural materials and sustainable, functional objects along with an appreciation of art. The world may be abuzz with the use of sustainable, responsibly harvested materials now however Ary Home has been quietly adhering to this credo for 65 years. Åry’s coasters are made from layers of the finest natural wood. Each layer is made from a single sheet of wood to keep it pure and hygienic. Åry actively seek work from new artists and designers from around the world with fresh ideas and a distinct identity, resulting in coasters that are little pieces of liveable art. There’s no better example of this than the Strawberry Thief set. 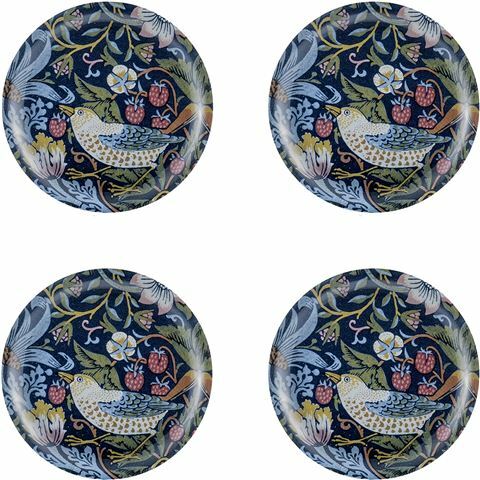 Created in collaboration with the Victoria and Albert Art museum in London, who utilised William Morris' iconic Strawberry Thief pattern. Designed in collaboration with the V & A Museum from William Morris’s Strawberry Thief pattern. Presented as a set of four in an Åry’s box.